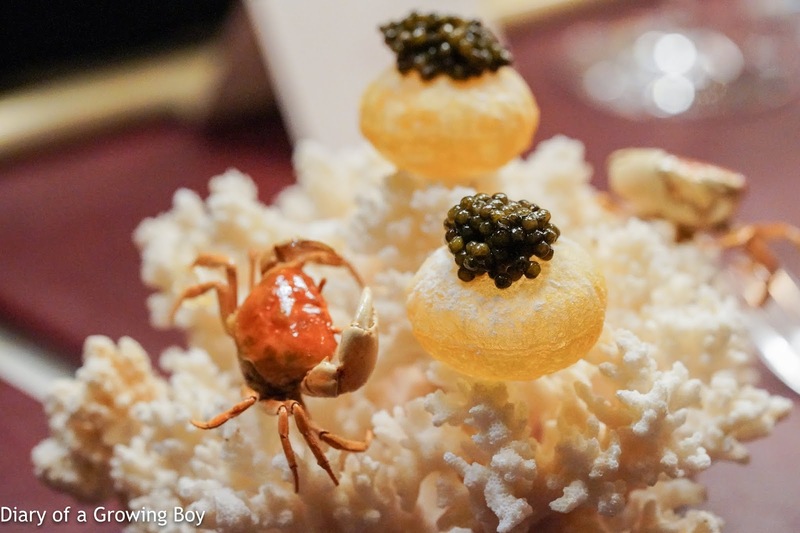 Robin Zavou has since taken over as the Executive Chef of the hotel, and is personally overseeing the Krug Room. It's now been two years, and thanks to an invitation on behalf of the hotel, tonight would be the first chance for me to see what has happened since then. 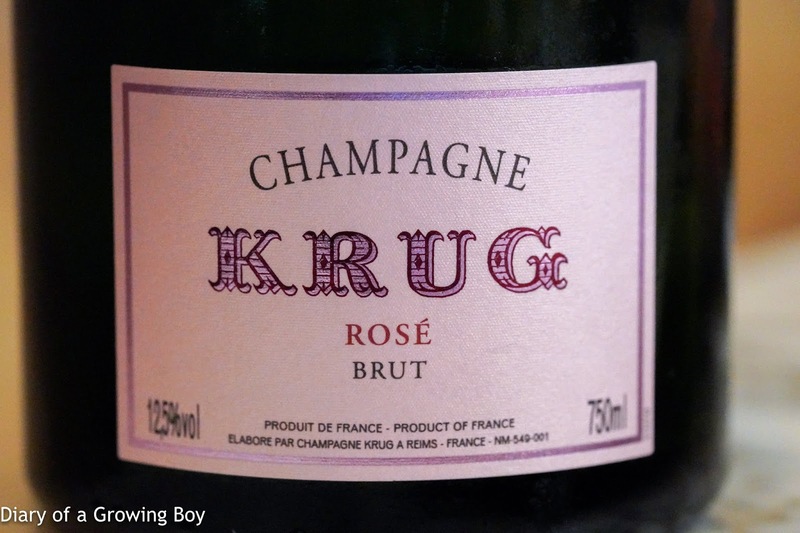 As usual, we started with a glass of Krug Grande Cuvée while we waited for everyone to arrive. 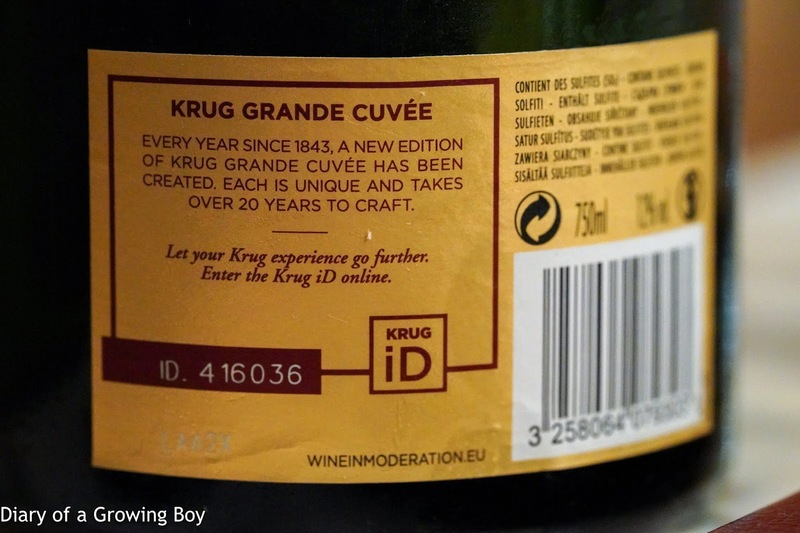 Our first glass was Krug Grande Cuvée, 164éme édition, en magnum, ID 216018. This was toasty and nicely integrated. 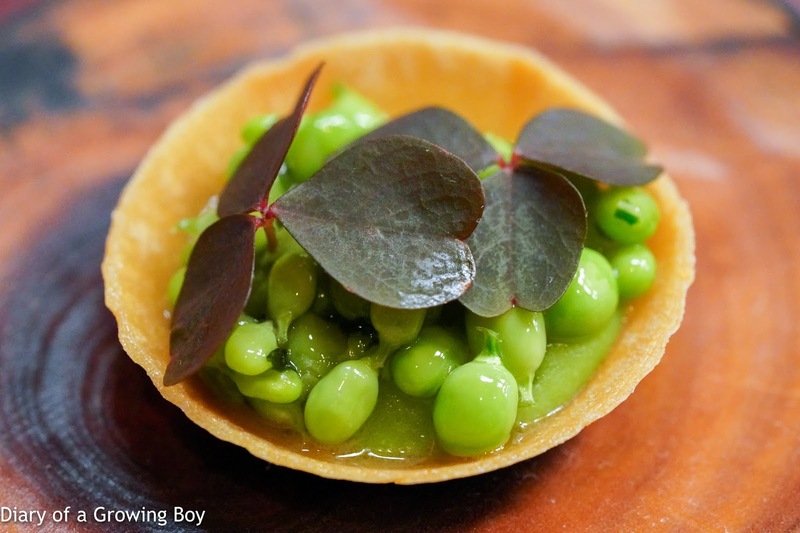 Pea tart - with wood sorrel. 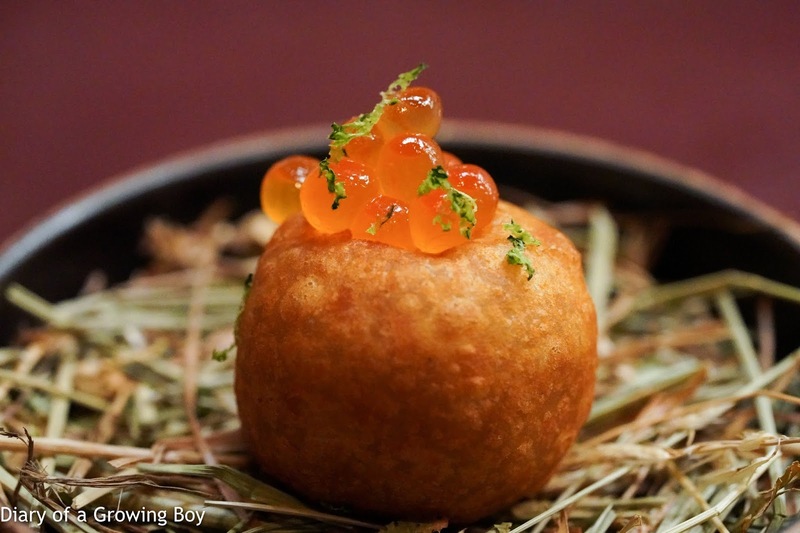 Smoked eel donut - topped with salmon roe marinated in sake and a sprinkle of shaved yuzu (柚子) zest. 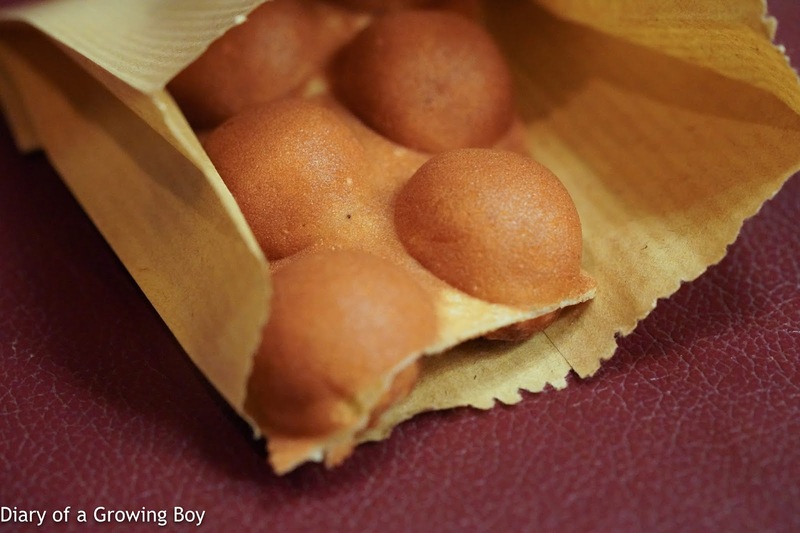 The eel mousse inside was smoky, and very, very soft and smooth in texture. 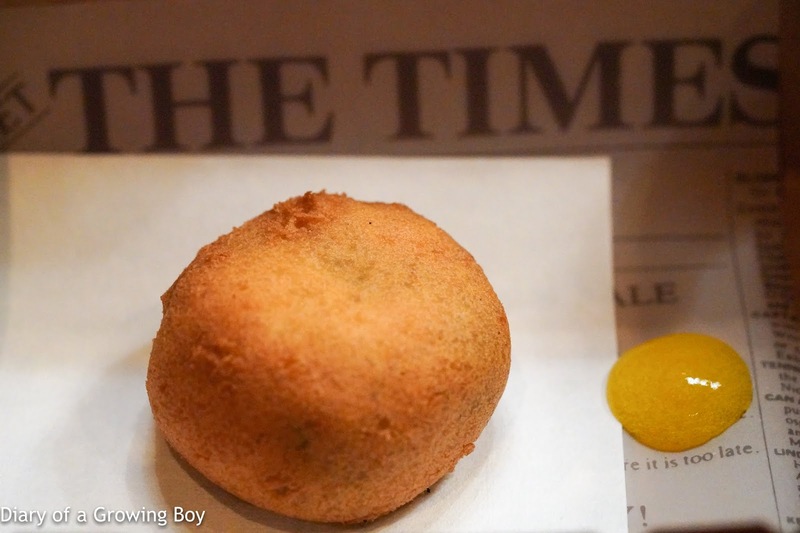 Hong Kong waffle - with Parmesan and truffle. Too bad this was limp and soggy. Prawn, red, betel leaf, finger lime, tamarind - the Sicilian red prawn had its head chargrilled, and the tail was marinated in tomato and tamarind. 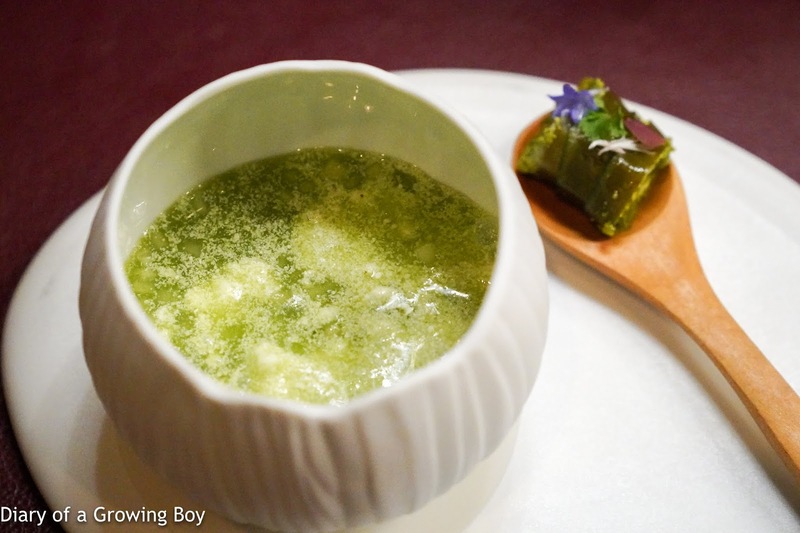 The condiments included Thai betel leaves - which are commonly used to make miang kam (เมี่ยงคะน้า) - and two different dips of ponzu (ポン酢) jelly and homemade fermented scallop sauce. 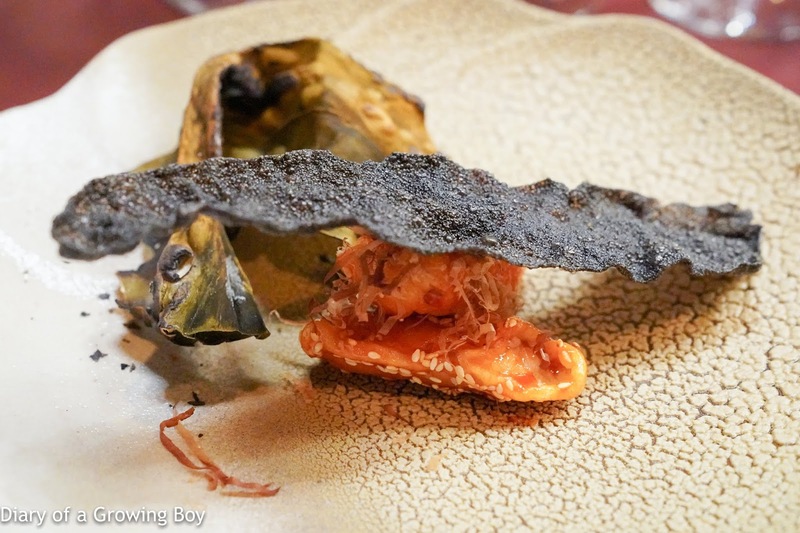 We were supposed to make tacos by wrapping the prawn in the betel leaves, so that was what I did... after drizzling the liquid goodies from the prawn head on top of the tail. 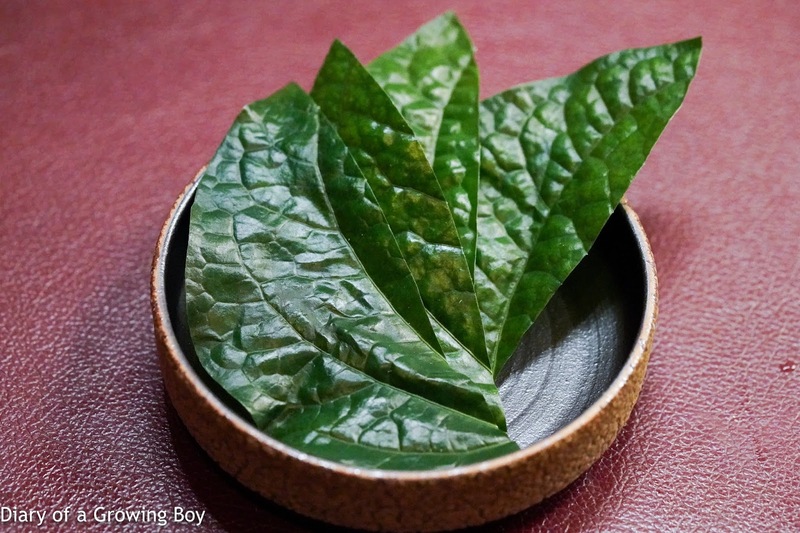 The smarter people at the table - such as The Great One sitting next to me - rolled the leaves into cones the way one would make miang kam. Regardless of preparation style, the contents themselves were simply amazing. 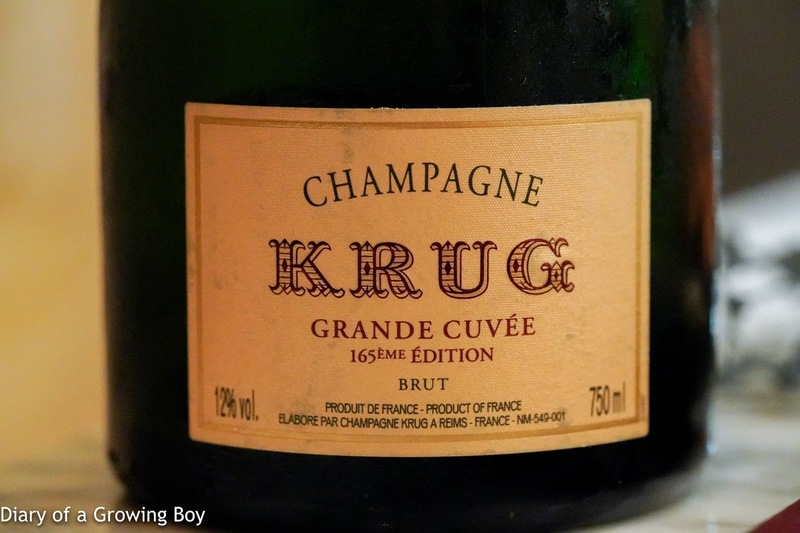 Krug Grande Cuvée, 165éme édition, ID 416036 - a bit more mousse and a little fresher. Base wine was 2009. 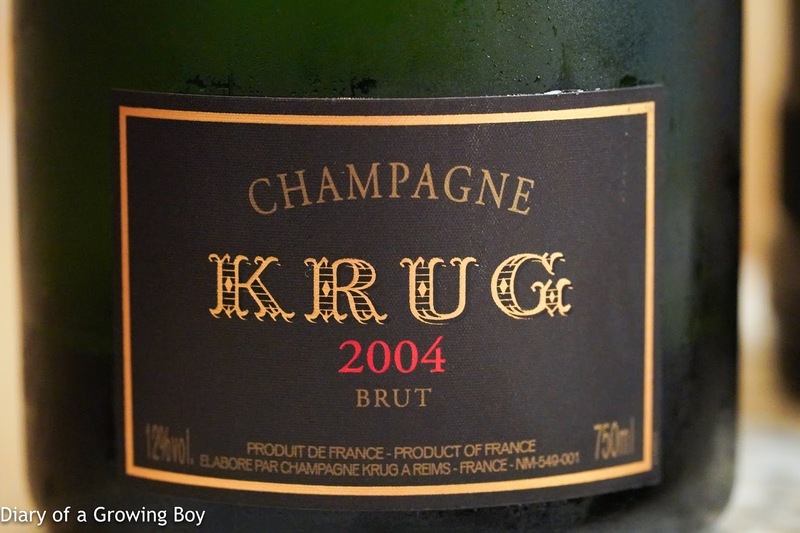 The smallest production for the Grande Cuvée in history, thanks to the Global Financial Crisis. This is only available in 4 markets - France, US, UK, and HK. 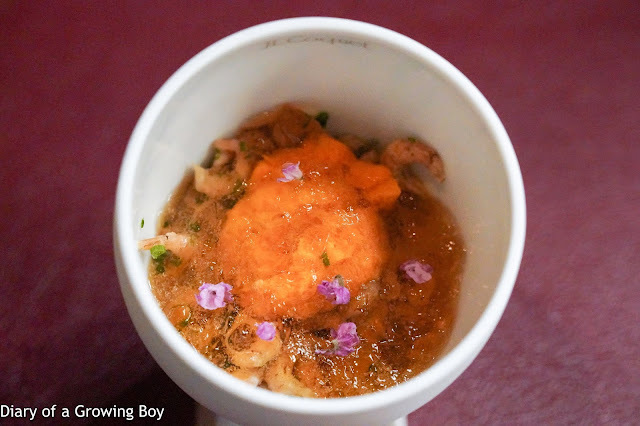 Shrimp, sea urchin, cauliflower, soy - apparently inspired by krabbentoast, we have fermented cauliflower cream, a layer of North Sea brown shrimp (the same crevettes grises I enjoyed in Belgium and France) cooked in butter, sea urchin, and soy gelée. Garnished with some perilla flowers. Needless to say this was totally delicious, and I especially loved the soy gelée. Pomme soufflé with oscietra caviar came with some acidity, and Japanese river crab (沢蟹). 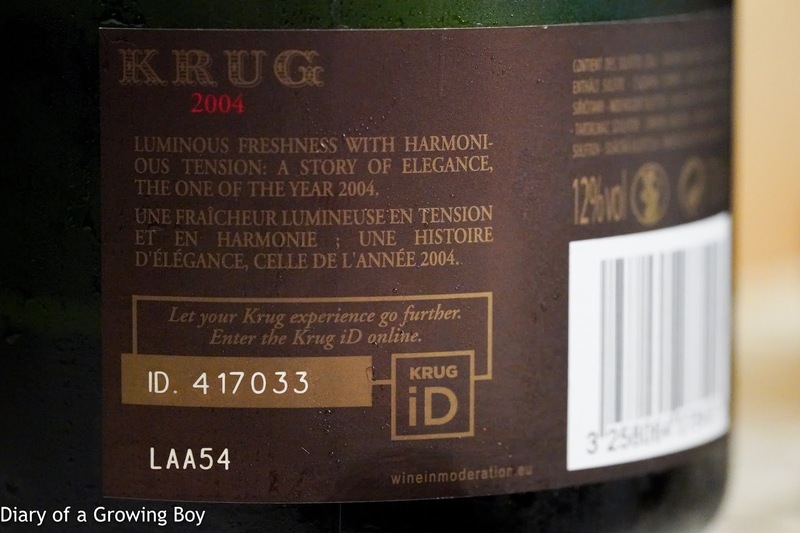 2004 Krug, ID 417033 - a little grippy on the palate, with a hint of nuttiness. Juice, green, tomato, goat - tomato gazpacho with homemade kombucha flavored with celery and cucumber, with freeze-dried yogurt. 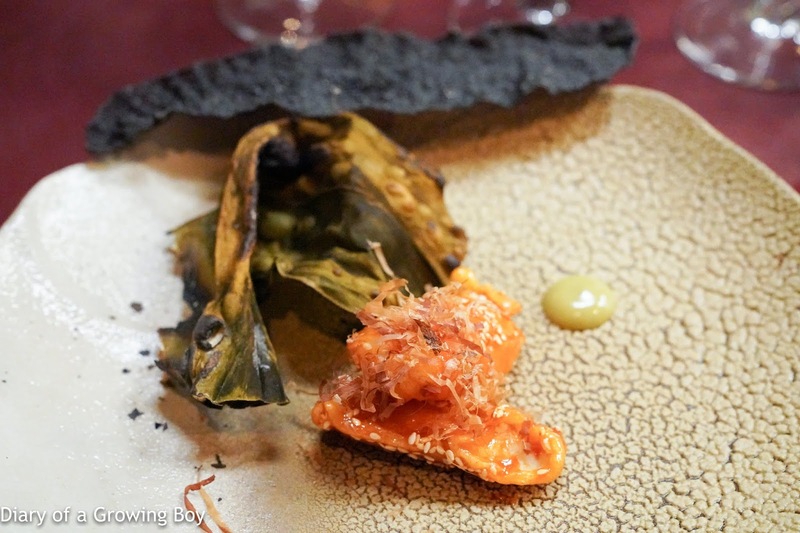 Definitely lots of tomato flavors here, as well as a little umami. Nice and crisp acidity with sweetness as well as creaminess. 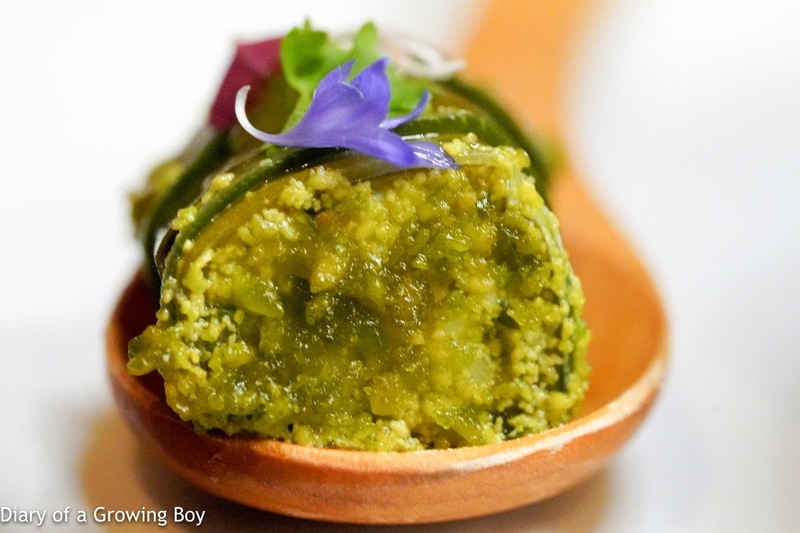 Pickled and roasted cucumber with goat cheese mousse on the spoon, which had some acidity from the cheese. KFC, crab, Korean, lime - in this case Alaskan king crab instead of chicken. 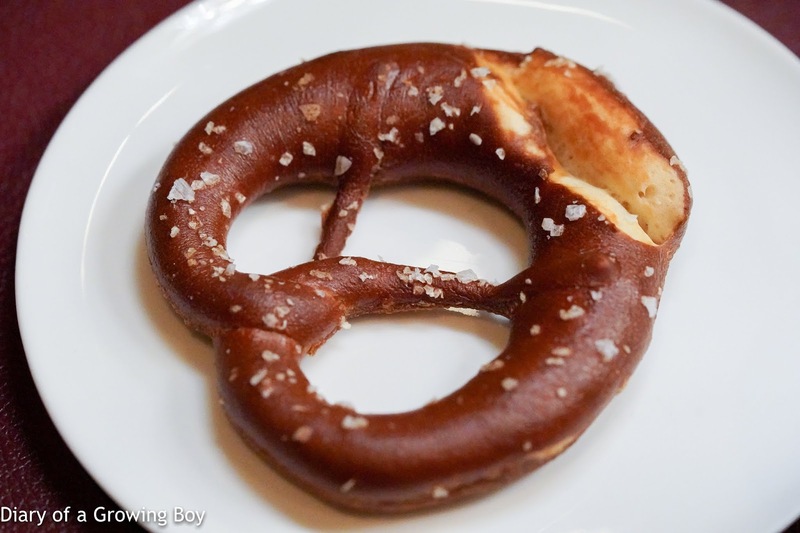 Battered and lathered with a Korean-style sweet/sour/spicy sauce, then sprinkled with sesame and bonito flakes. 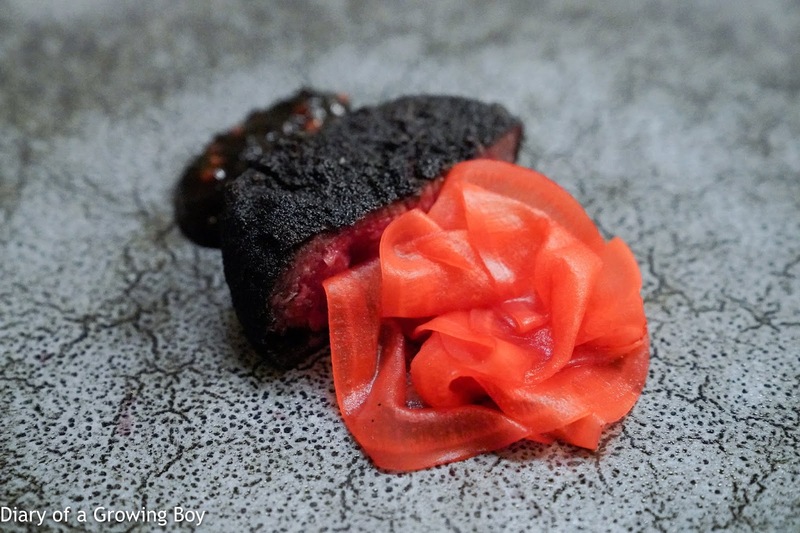 Squid ink tapioca cracker on top, and some roasted kelp on the side. The little green dot actually tasted a little like crab tomalley. Pork, suckling, Iberico, taco - I would love any suckling pig, and this one was no exception. 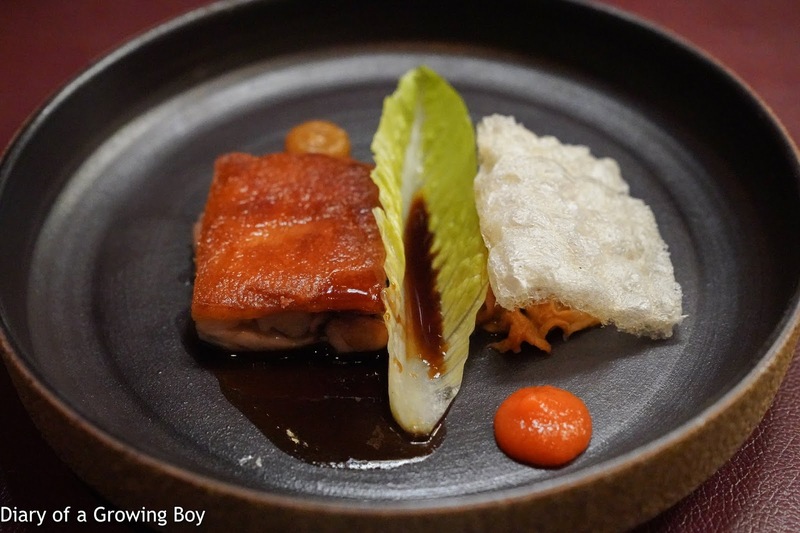 I love the sight of crispy crackling... 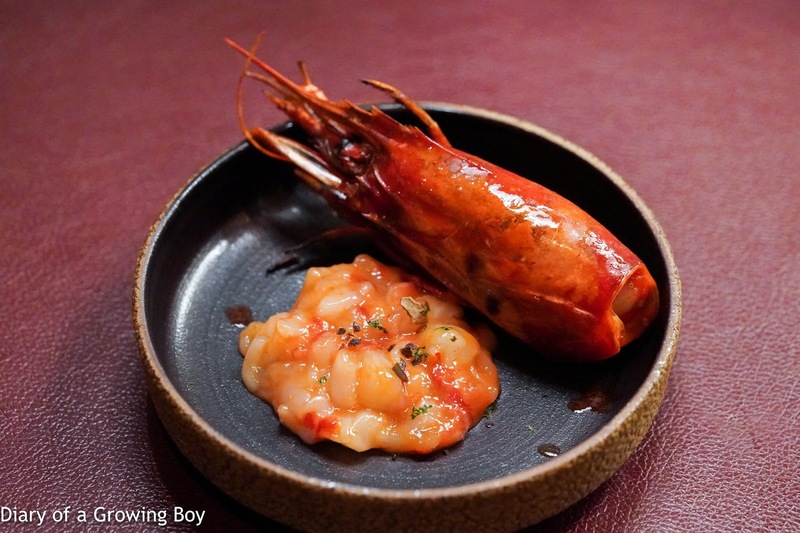 Served with fermented chili sauce as well as apple purée. 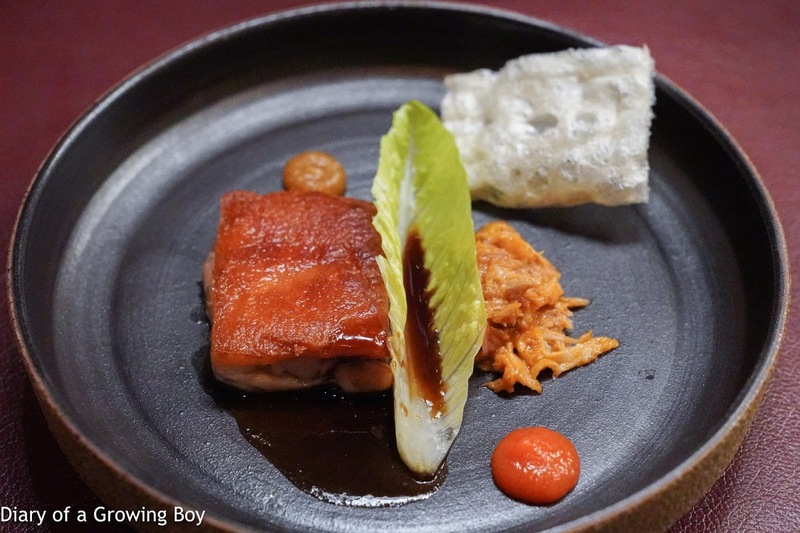 And lifting the dehydrated pork crackling - which had been cooked for 48 hours - revealed the pulled pork underneath. Did I say how much I love suckling pig already? 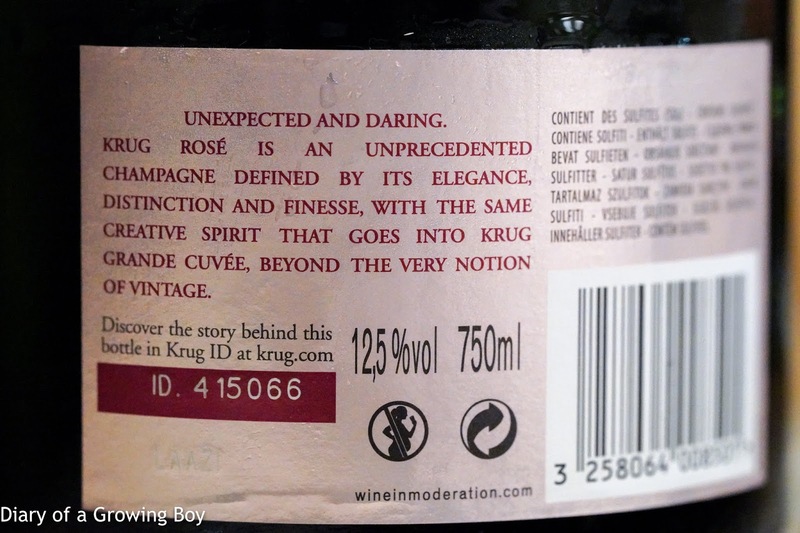 Krug Rosé, 20éme édition, ID 415066 - a little bit of red fruits. Wagyu, smoked, nori, pickle - beef katsu (牛カツ) cutlets are all the rage nowadays, so naturally they've got their own version here... 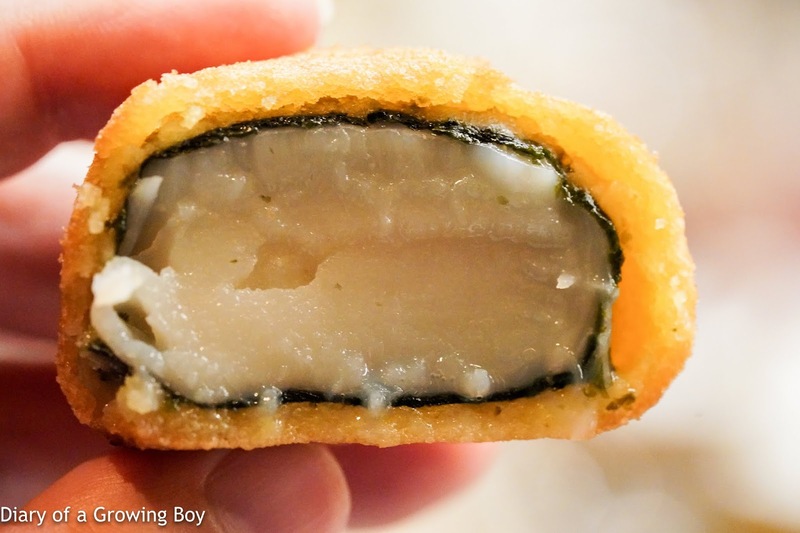 The crust was made with crumbs, onions, and squid ink. 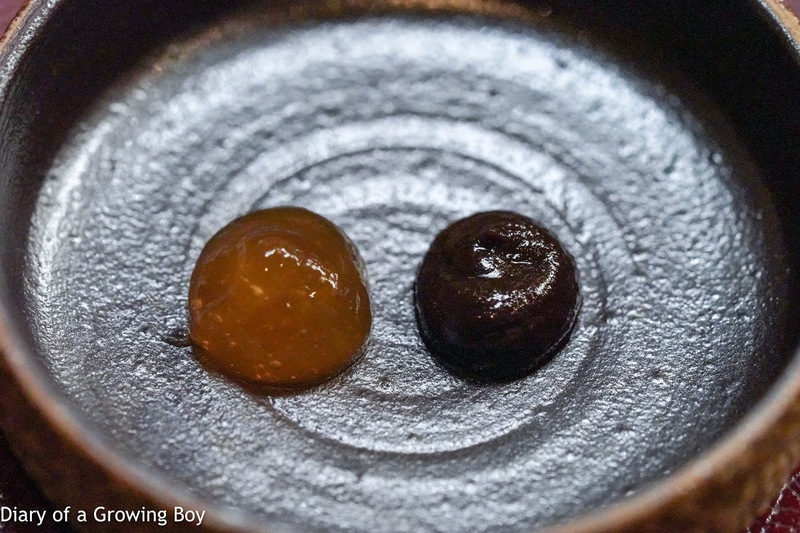 With pickled radish scented with yuzu on the side as well as some fermented nori (海苔) seaweed sauce with wasabi. 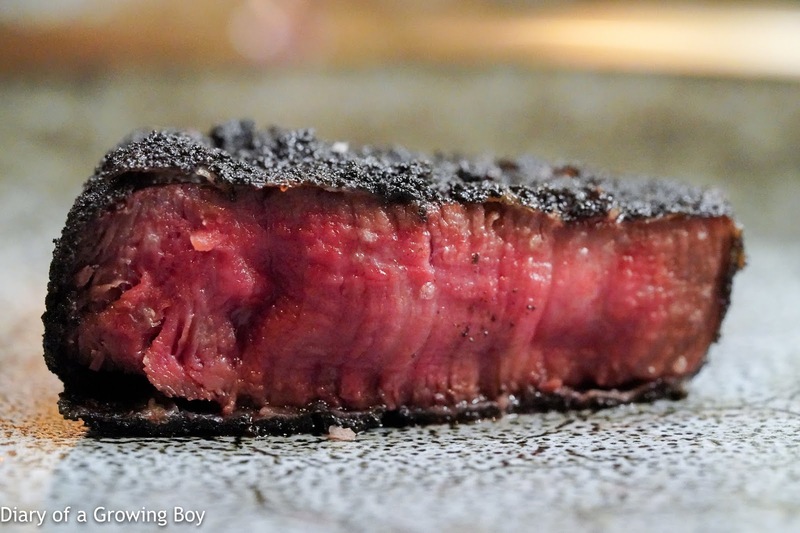 Pretty nice color on the A5 Kuroge wagyu (黒毛和牛) from Saga (佐賀). At this point we were moved to the kitchen so they could prep the room for dessert. 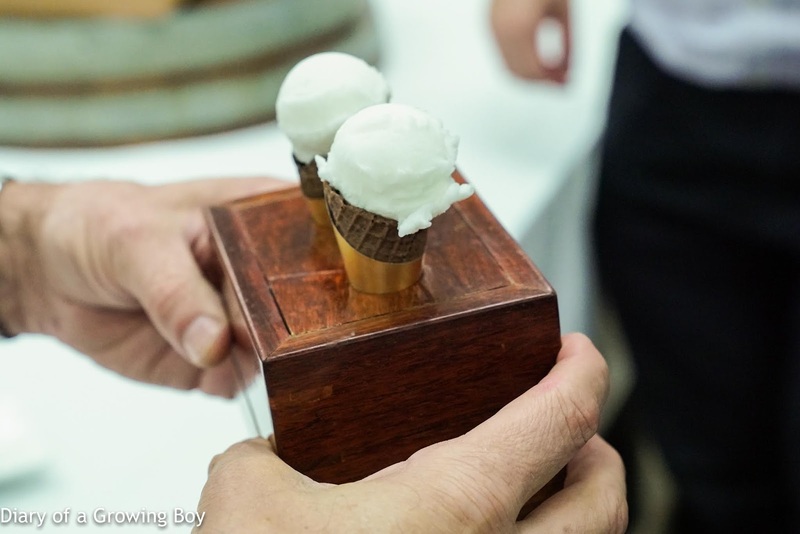 Cone, Amalfi, lemon, ice - the sorbet was made with Amalfi lemon, limoncello, and confit lemon zest. There was a thin layer of chocolate in the cone. Ocean, coconut, pineapple, pepper - always fun to watch the team put the final dessert together with a bewildering array of elements. We've got coconut espuma with a yuzu pearl in the open scallop shell, along with a frozen meringue which was made of seaweed in my case. 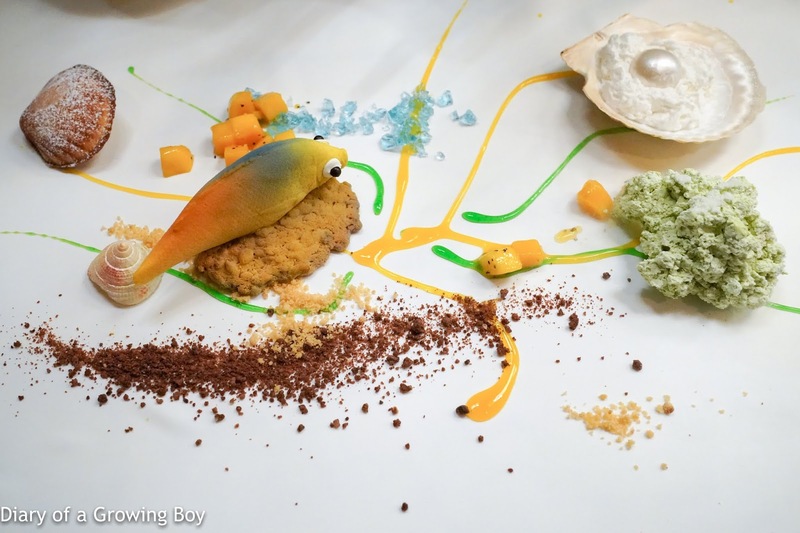 Powdered brownies and cookies became sand, with Champagne gelée pretending to be the blue ocean, and some mango coulis and diced mango. The madeleine sea shells were too wet and soggy unfortunately, and I seem to be missing a white chocolate sea shell. Finally the "plastic" fish was made with mango and pineapple into a soft mousse or meringue, with a filling of stewed pineapples. The cookie base underneath the fish tasted like an English fruitcake. Many thanks to the powers that be for inviting me to this dinner with many delicious dishes.